Hmm… shades of a recent DC Metro derailment, anyone? The one where the geometry car saw a problem and they just hit the “ignore” button because it made their job easier? I hope this isn’t like that. It’s early. Who knows. Not quite reasonable to say “because it made their lives easier.” Moreso “because the process was stupid and broken and somebody was bound to screw it up at some point,” as far as I can tell—there’s somebody who’s job it is to monitor for and screen out false positives, and by the sound of it false positives are pretty common. Recipe for screw-ups, that. I can’t see the wheels or whether there is any damage to them, but it looks like they broke off some big chunks of concrete from the tunnel. breakdowns and random delays are the new normal… nowadays i try to walk or use citibike for any trips less than 3 miles because the trains are too unreliable. and i avoid going between boroughs on sundays. Wait, single-tracking between Bedford-Nostrand and Court Square? Can’t they just short-turn at Bedford-Nostrand the way they usually do when they’re working on something between there and the south end of the line? They were almost surely using both tracks north of Bedford-Nostrand. Ben most likely typo’ed. Confirmed. 2 tracks north of B-N. I saw decent service (slight delays) at Nassau around 6 am. They tried to run a shuttle south of B-N to Fulton, but I’m guessing it wasn’t that effective on one track, especially during rush hour. For all its “what could have been” stories, that B-N station does come through in situations like this! 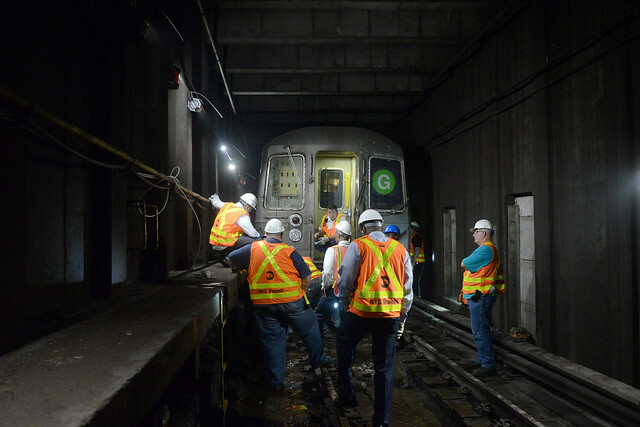 It can, but the mta looks for the cheap solution when running trains on a modified schedule. You can run full G train service during the rush because there are switches between BN and Myrtle and switches between BN and Classon. Since service is single-tracked to the queens-bound track, you can use the Church Avenue-bound track as a layup to turn trains. Although all trains have to pass through the center track to return to Queens, it is still feasible with the 8tph G schedule. This is based on the nyc subway.org track maps and the G train schedule on the mta website. It looks like G-Train stations are finally getting speakers and Transit Wireless’s installations (Nassau has both, but not operational). The new ad unit at Nassau didn’t display anything except news about the service disruption, which everyone crowded around, the entire time. Win? Finally wireless underground coverage is moving to Brooklyn because I also saw Transit Wireless’s antenna system installed at Graham Avenue on the L (but not yet operational). It is a win because it shows progress with the cell coverage rollout (whenever it is activated which should be in a couple of weeks). I don’t understand how they prioritize this project. First up should be any underground major transfer point where multiple routing options are possible. So, coming to mind are Jay St and Hoyt-Schermerhorn. Many riders at these two stations would be able to take multiple trains, if there are problems, and the lack of wireless service means you might, say, arrive at Jay on an F wanting to transfer to the A, so you get off the F, but then the A has a problem…shoulda stayed on that F.
I can’t recall if the Atlantic Av complex has service, but that’s a no-brainer.